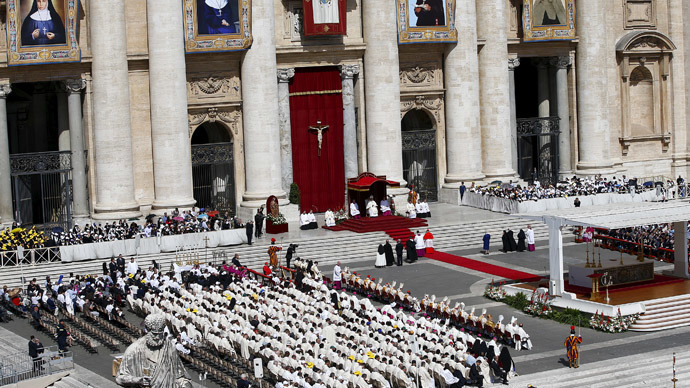 The sisters Marie Alphonsine Danil Ghattas and Mariam Baouardy, who lived in Ottoman Palestine in the 19th century, were among four nuns who were canonized at a mass in St. Peter's Square on Sunday. The ceremony was attended by the Palestinian leader, Mahmoud Abbas, and 2,000 pilgrims from the region, some with Palestinian flags. The pontiff said the Palestinian nuns, along with Jeanne Emilie de Villeneuve from France and Maria Cristina of the Immaculate Conception from Italy, were models who showed unity and charity to the world. Sister Marie Alphonsine Danil Ghattas “came to understand clearly what it means to radiate the love of God in the apostolate, and to be a witness to meekness and unity,” the pontiff said. Mariam Baouardy born in 1846, in Ottoman Syria, was a Carmelite nun of the Melkite Greek Catholic Church. Being a mystic, who has the stigmata, she cared for the poor. She experienced some miraculous survivals. Once she went blind for 40 days, but then suddenly recovered her vision. She was given the religious name Mary of Jesus Crucified. Marie Alphonsine Danil Ghattas, born in 1843 in Jerusalem, Ottoman Palestine, spent her whole life working for the poor. She founded the Dominican Sisters of the Most Holy Rosary of Jerusalem, the first Palestinian congregation. On Saturday the Catholic leader met Abbas. “May the angel of peace destroy the evil spirit of war. I thought of you: may you be an angel of peace,” Francis told Abbas, after presenting him a gift. The canonization ceremony comes four days after the state officially recognized the state of Palestine, following the finalization of a new treaty on Wednesday. The Holy See welcomed a decision by the UN General Assembly to recognize Palestine as a non-member observer state back in 2012. But the treaty on Wednesday, as yet to be formally signed, is the first legal document between the Vatican and the state of Palestine. The treaty states the Vatican has switched its diplomatic allegiance from the Palestinian Liberation Organization to the state of Palestine. According to Vatican Foreign Minister Monsignor Antoine Camilleri, the move wasn’t politically motivated, but simply in line with the Holy See’s position. The treaty concerns the activities of the Catholic Church in Palestine. In April 2014, a Catholic Monastery was vandalized near the Israeli capital of Jerusalem in a hate crime carried out by Israelis. Slogans condemning peace talks with Palestine and graffiti disparaging Jesus and Mary were daubed on the walls.